Crafted in sterling silver, this Jingle Bell charm from Chamilia will help you celebrate the festive period in style. 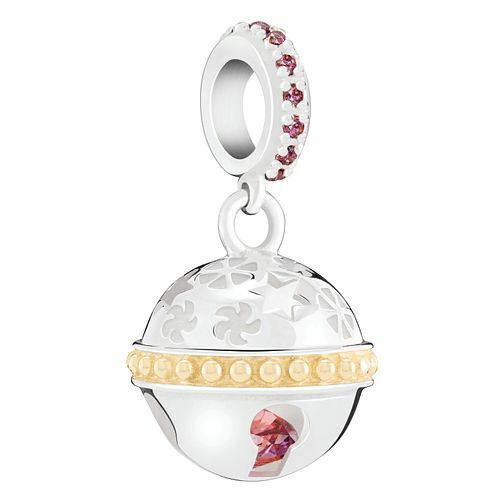 Designed using rich golden enamels and luxurious red Swarovski crystals, this charming bead features a bell with a red crystal inside. Inspired by your personal sense of style, Chamilia jewellery is as unique as you are. Chamilia Jingle Bell Charm with Gold Electroplating is rated 4.8 out of 5 by 4. Rated 5 out of 5 by Anonymous from Beautiful Piece Absolutely love this had some money for christmas and decided on this, was not disappointed.It is beautiful by far the nicest on my bracelet.